I have been running since I was 13. I ran Cross Country in middle school, and I immediately fell in love. I tried to run track, but found that Cross Country better suited my long legs. In my adult life, I have only run 5K’s until after the birth of my second son in 2005. In 2009 I had a friend tell me she ran the Indianapolis500 mini marathon. I was desperate for something to get me motivated to get back into shape because I had never been a couch potato in my whole life. I struggled with motivation after my second son’s birth, so I thought; PFFT I CAN run a half marathon if SHE can. 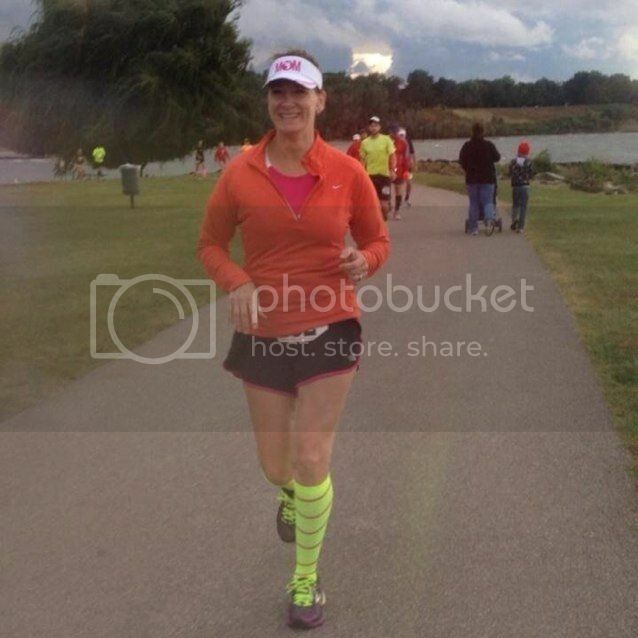 I entered the race and ran my first half marathon, in May 2010, at the young age of 45, and I’ve been hooked since. Unfortunately, I think the death of my oldest sister got me to start running. I don’t remember the sequence of events, but after she died I had a lot going on in my head. I had a lot of crazy bad dreams. My mom encouraged me to join a sport and I remember going to the call out for Cross Country thinking, “Oh great I have to run! ?” I was encouraged a lot by my coach and I remember enjoying the endurance portion of the runs but did not like running fast. My coach encouraged me quite a bit to keep pushing forward and to never give up and that has remained with me. I remember pushing as hard as I could and coming in third place. I was so proud of myself in that moment. After high school I kept running to keep active and to enjoy the solitude and peace with myself. It has helped me deal with lots of things in life. I can’t run without my phone. I run on country roads and so I like to have it just in case something happens where I would need to call my husband. I need my pepper spray because I encountered three dogs on my route and my pepper spray gives me a sense of security. I NEED my Garmin for the time of day. I run after I get off work and only have about 25-30 minutes to get a run in before the school bus drops off my son. I call this #projectbeatthebushome. Okay I have two: My favorite half marathon is the IndianapolisMonumental half. It is a flat and fast course. I get a personal best EVERY time I run it. My second favorite is the North Coast 24 hour endurance race, this is a place to push your body to its limits and see what it’s capable of. Life happens - follow your training plan as much as possible. Don’t try make-up any runs; just move on to the next day and trust your training.